Home Our Garage Door Services Garage Door Repair Why is My Garage Door Broken? At Garage Door Repair Fort Worth we see all sorts of related problems come our way. We fix everything, no matter how large or small, and our professional technicians are capable of remedying any issue. We often see the same issues cropping up amongst so we've decided to list the most common below, have a read! Each and every garage door manufactured in the last 25 years is fitted with a safety sensor. This gadget is attached to your door and detects whether anything is in the way - if someone or something is in the door’s path, it will immediately stop the door from moving. This is a great safety feature, and prevents some nasty accidents, but it can also cause some problems of its own. Because of the way the sensor works, a little dirt can make it think someone’s underneath the door! This causes a lot of confusion, and is one of the most common reasons why we’re called out to customer’s properties. A lot of people think their opener does all the hard work when their door opens or closes. This isn’t true; the opener pulls the door along, but it's the springs themselves which actually bear the strain of the door. Over time, they are susceptible to wearing out and can fail. When they do, this will put your door out of commission until the spring can be replaced. As springs begin to wear out, your door may become squeaky and wobbly, so keep an eye out for these warning signs. 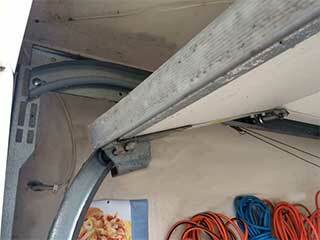 One of the most common causes of an inoperable garage door is a failed remote system. In our experience, homeowners can be quick to look for major problems with their system before considering the possibility of a broken remote. It’s important to bear in mind that the remote itself is only a part of the control system though. In addition to the remote you’ll use to open the door, the receiver and manual controls inside the door also have the potential to fail - these are first on our checklist when dealing with a door that just won’t budge! Our experienced garage door specialists are the number one team locally for excellent garage door service, maintenance, and repairs at the most affordable prices. We’re rated number one in customer loyalty and offer you the widest selection of brand-name doors to meet every budget. Check out our services and contact our team for the finest garage door services in town. Our technician will contact you before arriving. Until then, feel free to browse our website! Garage Door Repair Fort Worth is at your service!